Don’t move a mussel! Although a clever and catchy phrase, the magnitude of the message directed towards educating recreational boaters cannot be overstated. Until recently, the Pacific Northwest was one of the few areas safe from this costly invasive species. In the fall of 2016, Montana Fish, Wildlife and Parks (FWP) found microscope invasive quagga and zebra mussels in the Tiber Reservoir near Shelby, Montana, and Canyon Ferry Reservoir near Helena, and in July 2017, Montana FWP confirmed the quagga and zebra mussel sightings with DNA samples from Tiber Reservoir. Quagga and zebra mussels are the most expensive and devastating aquatic invasive species to invade the US, costing an estimated $5 billion annually for prevention and control. The quagga and zebra mussels are very similar in appearance with their striped and/or chevron patterned shells; however, the quagga mussel is slightly larger (0.8 to 1.6 inches) and paler. Zebra mussels range in color from tan, to brown, to black and are approximately 0.25 to 1.5 inches long. Both species of small mussels attach to any hard object with their strong byssal threads. A single mussel can lead to the production of a half a billion new mussels in their lifetime. Today, there is an estimated 10 trillion quagga and zebra mussels in the Great Lakes. Source: Peyer, S.M., J.C. Hermanson, and C.E. Lee. 2011. 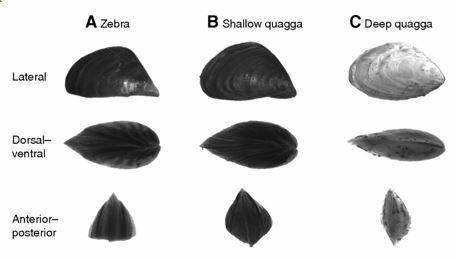 Effects of shell morphology on mechanics of zebra and quagga mussel locomotion. The Journal of Experimental Biology, 213:2226-2236. Quagga and zebra mussel infestations harm native mussel and fish populations, ruin beaches and vessels, and clog water intake pipes, leading to billions of dollars of damage each year. They devastate native species by stripping the food web of plankton, causing a cascading effect throughout the ecosystem. Zebra mussels are also believed to be a source of botulism, a fatal illness caused by the bacteria Clostridium botulinum that affects many species of fish, birds and mammals. The quagga and zebra mussels are indigenous to Ukraine and southern Russia, but have been accidentally introduced to numerous areas to become an invasive species worldwide. 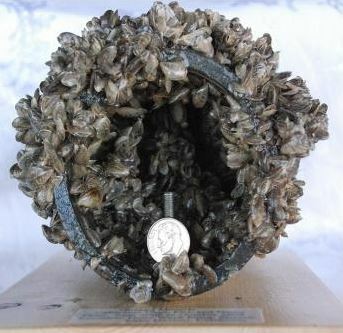 Zebra mussels were first detected in Canada in the Great Lakes in 1988, potentially after the release of ballast water from ships traversing the St. Lawrence Seaway. The quagga mussel was identified as a distinct species in the Great Lakes in 1991. By 2007, the mussels had spread in the US from the northeast to the southwest. The National Wildlife Federation shows the spread of quagga and zebra mussels across the US. Some states have taken drastic actions to prevent further spread of the mussels, such as the ban on recreational boating in uncontaminated lakes. Source: Mussel Prevention Program, San Luis Obispo Co., California. The recent discoveries in Montana do not necessarily mean that there are established breeding populations; however, the Tiber and Canyon Ferry reservoirs are now considered mussel-positive waterbodies. In the Montana Mussel Response, extensive sampling and mandatory boat inspections and decontamination will remain in place for at least the next few years to attempt to prevent population establishment and spread. These invasive species are not yet present in Washington or Oregon, but the documented presence in Montana brings them one step closer. The projected cost of controlling a quagga and zebra mussel infestation in the Pacific Northwest would be $500 million annually. To learn more about the threat of invasive mussels in Montana, check out this 5-episode podcast: “SubSurface: Resisting Montana’s Underwater Invaders.” This podcast examines what happens if Montana fails to stop the coming invasion of quagga and zebra mussels threatening the state’s waterbodies. Montana Public Radio’s Nicky Ouellet looks into Montana’s future (or one possible future) to see how the invasive mussels changed the Great Lakes and examines Montana’s efforts to detect and prevent their spread. To avoid unwanted hitch-hikers, always decon and prevent the spread of invasive species in our waters. The Season for GivingGirl Power!